Tipless restaurants: The Linkery’s owner explains why abolishing tipping made service better. 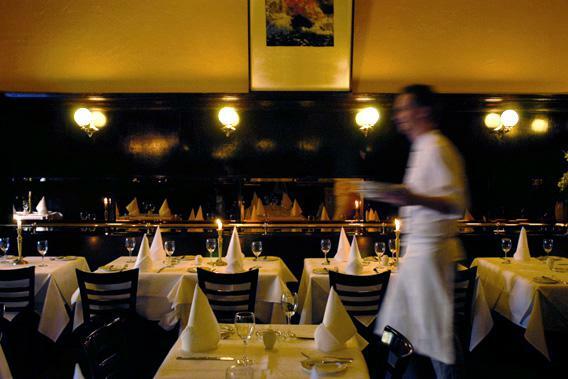 I got rid of gratuities at my restaurant, and our service only got better. In restaurants where gratuity is built into the check and tips are banned, waiters still have an incentive to give good service—they want to keep their jobs, and they want raises. For more than six years, I ran a restaurant without tips. We made this change because we wanted to distribute the “tip” revenue to our cooks as well as our servers, making our pay more equitable. Servers and cooks typically made similar base wages—and minimum wage was the same for both jobs—but servers kept all the tips, which could often mean they were taking home three times what the cooks made, or more. In California at that time, it was illegal to distribute any tip money to cooks. (Recent court rulings in the Western U.S. have loosened that restriction somewhat). By replacing tipping with a service charge, we were legally able to redirect about a quarter of that revenue to the kitchen, which reduced the income disparity and helped foster unity on our team. We had considered just incorporating that charge into the cost of each menu item, but we decided that it was easier for consumers to understand our pricing if we kept it analogous to that of a tipped restaurant. In a similar vein, we applied the service charge only to dining-in checks, since tipping is not yet a firmly established social norm for takeout. We used this service charge as a substitute for tipping from 2006 until we closed the restaurant this year to move to San Francisco. When we switched from tipping to a service charge, our food improved, probably because our cooks were being paid more and didn’t feel taken for granted. In turn, business improved, and within a couple of months, our server team was making more money than it had under the tipped system. The quality of our service also improved. In my observation, however, that wasn’t mainly because the servers were making more money (although that helped, too). Instead, our service improved principally because eliminating tips makes it easier to provide good service. These two principles probably apply at your work, too, if you work somewhere other than a restaurant and with your clothes on. They’re a well-established way of compensating people, in part because if you don’t have to always think about money, you can focus on doing your job well. Software engineers, marriage counselors, bridge builders, you name the profession—in almost every industry, it’s expected you’ll be able to do your best work if you’re not constantly distracted by compensation issues. Why don’t we want that for restaurant servers? I can hear your objection now: How could servers be motivated to do a good job without tips? Creating a non-tipping culture in restaurants is possible. We made our non-tipping restaurant work in the U.S. for more than six years, and from what I saw, eliminating tipping is a superior model. And, as Slate’s Brian Palmer has shown, there’s plenty of research to back up my observations. Studies have shown that tipping is not an effective incentive for performance in servers. It also creates an environment in which people of color, young people, old people, women, and foreigners tend to get worse service than white males. In a tip-based system, nonwhite servers make less than their white peers for equal work. Consider also the power imbalance between tippers, who are typically male, and servers, 70 percent of whom are female, and consider that the restaurant industry generates five times the average number of sexual harassment claims per worker. And that in many instances employers have allegedly misused tip credits, which let owners pay servers less than minimum wage if tipping makes up the difference. Despite—or maybe because of—all the documented damage caused by tip culture, plenty of people are deeply, emotionally invested in keeping tipping propped up. When we abolished tipping at the Linkery, we met a few of these people. We would periodically hear guests express anger about not being able to choose the amount of their tip. Their refrain was, It’s not about money … I always tip more than 20 percent. These people were angry even though they had spent less than they otherwise would have, because they had been robbed of their perceived power over their server. We also had guests—including, most memorably, a local food writer—who’d ask us, If you have a fixed charge, how are we supposed to punish our server for mistakes? In the case of the food writer, she opted to publish an article dressing down her server, using his real name, in the local alt-weekly. I’d suggest talking to or emailing a manager if you have service problems with any business. I think the most notable opponent we encountered who wanted to cling to the tipping model was our local city attorney. In spite of our posted signs and check stamps and menu text and blog posts that outlined the service charge, his office accused us of trying to deceive consumers with it, and threatened me with fines and jail time. I thought this made me a special kind of outlaw, until this year when the same city attorney tried to stick one of my neighbors with 13 years in jail for writing protest slogans on the sidewalk using water-soluble children’s chalk. In neither case did the prosecutor prevail. But the example illustrates, I think, the kind of person who will fight to save tipping culture: a person who lives in a world of offenses and punishment, someone invested in the idea of authority and the feeling of power. Incidentally, this kind of person is often a middle-aged white guy. Thanks to people like this, the forces of tipping may have the upper hand, for now. But, if more businesses experiment with alternative models, and courts are eventually asked to grapple with tipping’s discrimination issues, the situation may change. Maybe in a not-too-distant future, every restaurant will present us a bill that includes everything we’re supposed to pay, including enough to pay good wages to all the people who work there. It’s a system that’s successful in other industries, and in restaurants in other countries. It can work here, too—and it can work better, in almost every way, than the system we have now.